Gift Certificate for 30 minute reading with medium Sharon Anne Klingler. Purchase online and the recipient can contact Andrea at 440-759-3431 to schedule an appointment. 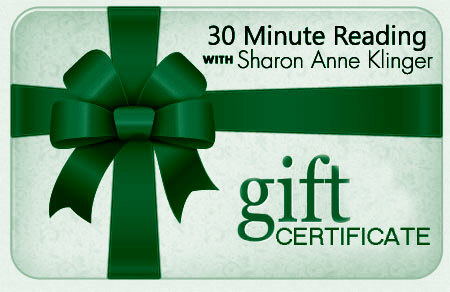 Sharon’s reading rates: 30 minutes, $250; 45 minutes $350; and 60 minutes, $450. Upon order processing the recipient can contact Andrea at 440-759-3431 to schedule an appointment. Please confirm the purchaser’s name and order number at the time of booking.